There were these two Engineers who decided they would go moose hunting in the backwoods of British Columbia. As it happened, they lucked out and got a moose. Unfortunately, they were about a mile from their truck. They were having a tough time dragging the animal by the hind legs when a Wildlife Biologist happened upon them. He said, "You know, the hair follicles on a moose have a grain to them that causes the hair to lie toward the back. The way you are dragging that moose, it increases your coefficient of friction by a huge margin. If you grab it by the antlers and pull, you will find the work required to be quite minimal." 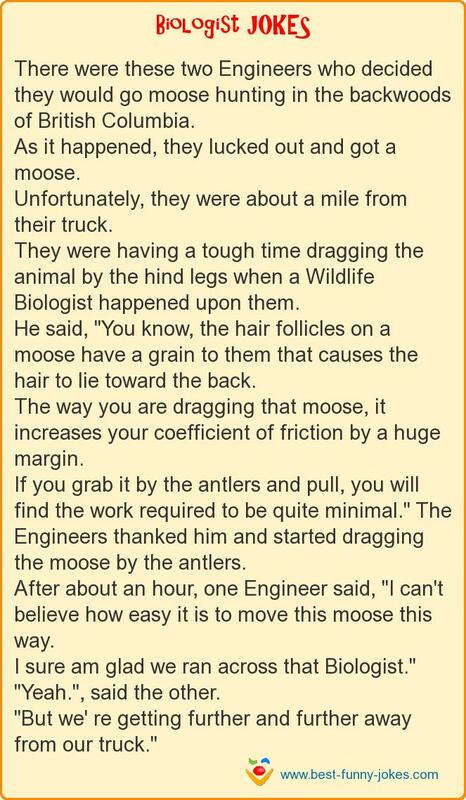 The Engineers thanked him and started dragging the moose by the antlers. After about an hour, one Engineer said, "I can't believe how easy it is to move this moose this way. I sure am glad we ran across that Biologist." "Yeah. ", said the other. "But we' re getting further and further away from our truck."